Tampa, Fla. – (October 10, 2018) – Co-authors Dr. Talia Esnard and Dr. Deirdre Cobb-Roberts are commemorating the release of their new book “Black Women, Academe, and the Tenure Process in the United States and the Caribbean” at the University of South Florida’s Tampa campus on Tuesday, Nov. 13. The book launch, featuring a discussion and Q&A from the authors, will take place from 2:00-4:30 p.m. in the Marshall Student Center, room 2707. 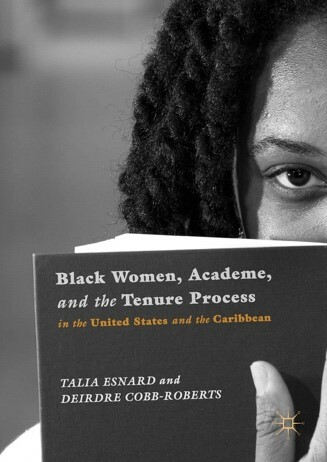 Released Sept. 20, “Black Women, Academe, and the Tenure Process in the United States and the Caribbean” explores the experiences and challenges faced by Black women faculty that are either on the tenure track or have earned tenure. The authors compare existing social inequalities, educational disparities, and injustices in the promotion and retention of Black women academics across two geographical spaces. Such interpretative examinations offer insight into how Black women’s subjugated knowledge and experiences continue to be suppressed within mainstream structures of power and how they are negotiated across contexts. Dr. Talia Esnard is a sociologist attached to the Department of Behavioural Sciences at the University of the West Indies in Trinidad and Tobago. Her research interests center on issues affecting Caribbean women who work within educational and entrepreneurial spheres. Some of Dr. Esnard’s work has been published in the Journal of Asian Academy of Management, NASPA Journal about Women in Higher Education, Journal of the Motherhood Initiative, Mentoring & Tutoring: Partnership in Learning, Journal of Educational Administration and History, and Women, Gender & Families of Color. She was a recipient of the Taiwan Research Fellowship (2012) and Caricom-Canada Faculty Leadership Program (2015, 2018). Dr. Deirdre Cobb-Roberts is an Associate Professor of Social Foundations in the Department of Educational and Psychological Studies. Her research focuses on historical and contemporary challenges of equity and treatment in American higher education. She has presented her work at major conferences, including the American Educational Research Association and the Critical Race Studies in Education Association. Dr. Cobb-Roberts’ publications include multiple book chapters and articles in the History of Education Quarterly, American Educational Research Journal, NASPA Journal about Women in Higher Education, amongst others. She was a recipient of the McKnight Faculty Fellowship (2003) and the Distinguished Alumni Award-University of Illinois (2011). The event is presented by the Institute on Black Life and Institute for the Study of Latin America and the Caribbean, both of which are part of the University of South Florida’s College of Arts and Sciences, and co-sponsored by Black Graduate Professional Student Association and the College of Education Diversity Committee. This event is free and open to the public. Light refreshments will be served. For reasonable accommodations, please email Paula Lezama at plezama@usf.edu at least 5 days prior to the event. The College of Arts and Sciences is the intellectual heart of the University of South Florida. We are a community of teachers and scholars united in the belief that broadly educated people are the basis of a just, free and prosperous society. By focusing on the big questions facing all of humanity, we prepare students for successful personal and professional lives. By conducting innovative, interdisciplinary research and scholarship, we advance knowledge in ways that prepare us to address vexing social problems and enhance quality of life for people and communities.